Then we want to help you purchase your very first vehicle. With the help of GM's Student Bonus program, you can save up to $750 off the price of an eligible Chevrolet, Cadillac, Buick, or GMC vehicle.Read for more details. 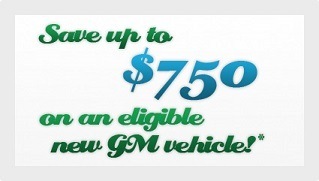 Please visit GM's Student Bonus Home Page for a full list of eligible vehicles.